In a large saucepan, heat the butter on medium, swirling the pan occasionally. When the butter starts to turn brown, reduce the heat to medium-low. Add the flour and cook, whisking constantly, for two minutes. Slowly add the hot milk in a thin stream, whisking constantly, until the sauce thickens and starts to simmer, two to three minutes. 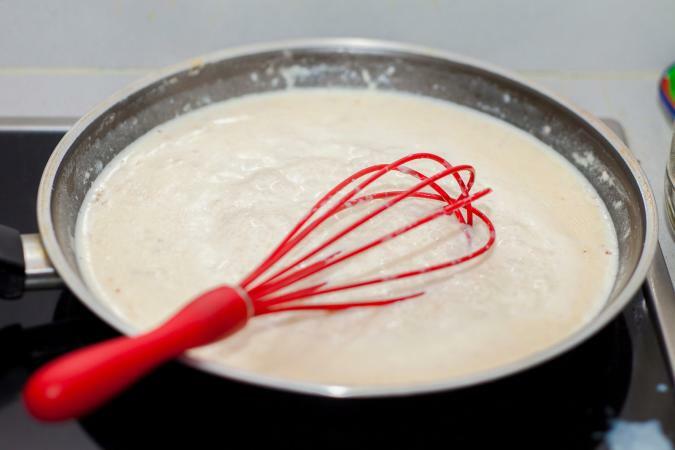 Whisk in the heavy cream, salt, and pepper. While the nuttiness of the butter makes this sauce interesting on its own, you can add other flavors, as well. Whisk in 1/2 cup of Parmesan cheese and 1/2 teaspoon of garlic powder as the sauce simmers, stirring until the cheese melts. Replace the hot milk with hot mushroom broth (you can make this by soaking 2 ounces of dried porcini mushrooms in hot no-salt chicken broth for two hours and straining out the mushrooms). Add 1 teaspoon of chopped, fresh thyme when you add the salt and pepper. Replace the heavy cream with sour cream. Stir in 1/2 teaspoon of paprika when you add the salt and pepper. Yields 3 cups, or about six 1/2 cup servings. Serve as a sauce for roasted chicken breasts. Use 1 cup of the mushroom variation as the filling in a pot pie. Add shrimp sauteed in garlic to the first variation and serve it over pasta. Use it as a gravy for chicken-fried steak and mashed potatoes. Use it as a base for chipped beef on toast. Use half a recipe as a cream sauce with 3 cups of cooked pearl onions to make creamed onions. Use the sour cream variation with sauteed mushrooms and cooked beef tips to make stroganoff. Serve over egg noodles and top with 2 tablespoons of chopped, fresh parsley. Browning the butter in cream sauce adds a slight nutty flavor that separates it from a traditional cream sauce. Use it as you would any other béchamel or cream sauce for a flavorful twist on a traditional French mother sauce.